This fall, evoke a serene, calm, and romantic feel at your wedding with tones of Airy Blue. Essentially, this colour falls under the lighter shades of blue, and it was predicted by Pantone to be one of the top colours for the coming Fall 2016. 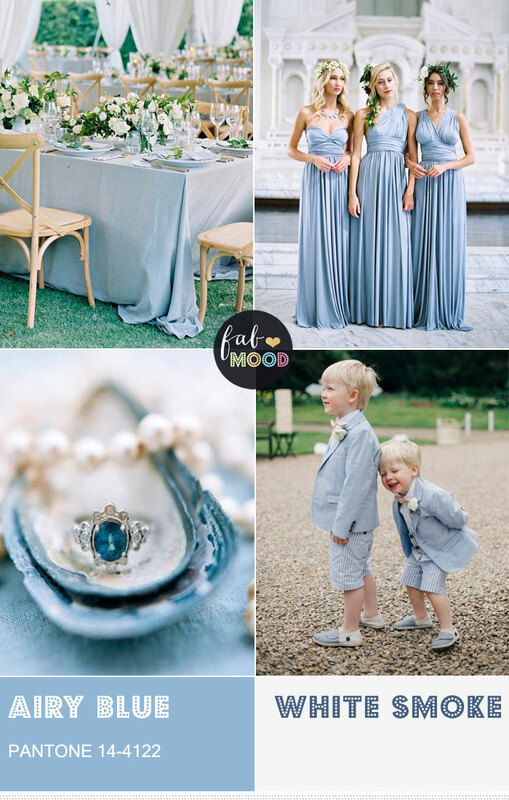 Similar to powder blues and the Pantone shade Serenity, it’s perfect for your nuptial celebrations and guarantees vibes of serenity and peace. The beauty of this delightful colour lies in the fact that, in reality, it’s perfect for pretty much any season! The gentle tone of Airy Blue simply emanates lightness and freedom that will make anyone feel like they can fly above the clouds. It speaks of the poetic idea of floating weightlessness above the conflict that many face living in the world today, symbolic of a couple standing strong together despite their challenges. Airy Blue is relatively easy to pair with other colours and shades. It goes well with the natural green of Lush Meadow, the muted hues of Taupe, and the subtlety of Dusty Cedar. But if you’re looking for a fresh approach, you can pair it up with the classic elegance of White Smoke and add hints of simple green. The bridesmaids and groomsmen can dress in the main colour. While the gals don Airy Blue dresses in different styles to give them a twist of personality. The groomsmen can put on Airy Blue suits matched with White Smoke shirts and boutonnieres. In terms of décor, opt for some Airy Blue tablecloth to drape elegantly over the tables, and set them with bouquets of white roses mixed with their natural green leaves. Other classic twists, such as White Smoke curtains, can add a beautiful note to the overall proceedings. The bride, meanwhile, can dress up a traditional white gown with blue accessories, or opt to go modern in an Airy Blue gown accessorized with white pearls. The possibilities are truly endless!